A mix of wood species, an expansive gathering space and smart design choices combine to create a stunning lakeside timber frame home. 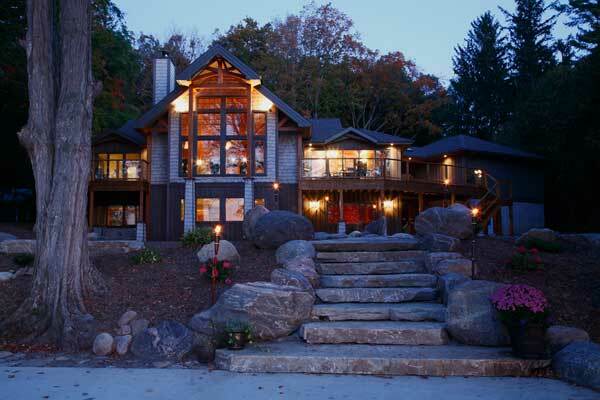 As night settles over the lake and the air cools, the lights of the Starke home, tucked into the canopy of the surrounding trees, invite warmth and the knowledge that, inside, a wood fire burns in the great room fireplace. To make room for the home, the Starkes selectively removed a dozen or so trees from the maple grove that fills their lakeside property. Many of the trees were then milled into boards and used to create various elements within the home, such as the bookshelves in the library, a wall unit in the media room and a TV cabinet in the great room. Sitting in her home office, on an upper-level balcony at the front of the Starke family home, Heather Starke looks out over an ash-and-wrought-iron railing to nearly 1,000 square feet of vaulted living space. From there, she can see straight through the center of the home to a wall of windows at the rear of the house, where the calm, gray water of the Kawartha lakes, just north of Peterborough, Ontario, stretch out like a giant silk sheet to the south. For the Starkes — Heather, Brian and two teenage daughters — this bold, dramatic use of space was a leading element in the design of their home, around which the remainder of the house would eventually evolve. A curved 18-foot Cambrian black granite countertop on rich cherry cabinets divides the space. At the front is the kitchen, open on three sides and backed only by a freestanding, or "floating," wall to separate it from the front entry. Against the wall rest the kitchen appliances and a bank of upper and lower cabinets. At the rear of the house, beneath a 20-foot vaulted cedar ceiling, the great room encompasses the largest portion of the room. Six-inch, ash flooring, with tight knots of chocolate-colored grain, lends a rustic air to the elegant abundance. A massive 5-by-26-inch Douglas fir glue-laminated beam slices crosswise through the center of the vaulted ceiling and serves as a testament to the complexity of engineering that brought this space to life. Heather explains that the kitchen has always been the hub of a Starke family home, so when it came time to design their dream home, naturally the space played a pivotal role. "We are very social people," Heather explains, "and I am sure, just like the next person, all our parties seemed to end up in the kitchen. So the idea was that, when you have the opportunity, why not create a kitchen as the focal point of the house?" It was Brian, she says, who first envisioned the idea, which the couple then brought to designer Craig McFarlane, a vice president of retail sales with the international home-package provider Linwood Custom Homes. The Starkes first encountered a Linwood home through friends, which Heather says gave them the opportunity to examine the quality of the company's work upfront. What impressed the couple the most was the degree of design flexibility Linwood also provided. Linwood was so flexible, in fact, that the Starkes ultimately designed an entirely custom home, now included as one of Linwood's packaged designs. "One of the things that we liked about Linwood was that it gave us the opportunity to do something unique," Heather says. "We didn't start with a package at all. We started with the design. We started with 'What do you want to build?'" 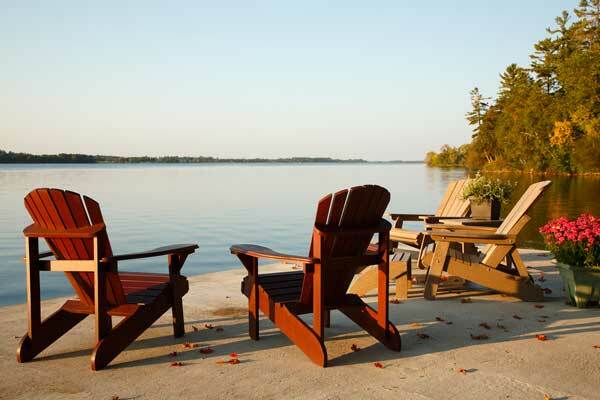 Retaining an old concrete wharf, where a boathouse once stood, allowed the Starkes to create a remarkable lakeside seating area, where Adirondack chairs enhance the serenity of their surroundings. The Windwood home, named for an old boat house that once stood on the Starke property, includes 4,660 square feet of finished space divided between two levels, with east and west wings extending off the center room. On the main level, a master suite fills the east wing, while a dining room, laundry room, half bath and pantry constitute the west. A stairway off the front entry leads to a walkout basement, carved into the gently sloping lot. A media room and library divide the center space of the lower level, off of which are three bedrooms, a utility room and a bath. When designing the home, the Starkes not only considered their present needs, but also anticipated future desires. The main-level master suite will enable future single-floor living and allow Heather and Brian to comfortably age in place, while the lower level, Heather admits, was partially designed with the hope of hosting a houseful of grandkids. "I hope that we are fortunate enough to enjoy this house for a long time," Heather says. "And if that's the case, it would be the kind of thing where their families come home and they have room where they can be with their kids." When asked if she would change anything in the home's design, Heather laughs. "There is one light switch, in a closet," she says, "but, honest to goodness, we got very lucky. This was the first house that my husband and I built, and I think we worked with a great builder."